UPDATE # 1 – March 23, 2018 – See below for new information on the Beekeeper saga. UPDATE # 2 – April 4, 2018 – We have found Elsie! I posted it on the Historic Boynton Beach Facebook page to get a few laughs, and people made comments such as “old-time online dating” and such; but some were curious – did our Mr. Honess find his “honey?” I was curious too, and started searching through Internet sources – and the story that emerged was far more interesting than I could have ever conjured up, relying on every obscure research source I had, and some knowledge that was particular to me. It made me think that Mr. Honess was somehow reaching out to have his story told. First, did Mr. Honess find his bride? Ancestry.com didn’t have any marriage records for him, but a database maintained from old Dade County marriages found the blessed event. In 1905, George Honess married Mrs. Anna Price of Hampstead, New York, in the Town of Delray. I began to wonder if George was one of the Linton/Delray Germans, a small colony that included people who were among Delray’s most important early pioneers – the Hofmans, Wueppers, and Zills. I searched Newspapers.com for any stories on George Honess. There was but one, from the 1905 Miami Metropolis, under the “New Suits” column – “George Honess vs. Annie Price Honess, bill for divorce. George G. Currie, plaintiff’s attorney.” (The Daily Miami Metropolis, April 25, 1907, Page 1). Mr. Honess was back to being a lonely bee-keeping bachelor. All references seemed to place Honess in Delray rather than Boynton as his ad stated – I surmised that he didn’t want the Delray postmaster to see all the letters coming in from the ladies! That gossip would probably have spread through town rather fast. With the newspaper archive disappointing, I turned to a general Internet search. 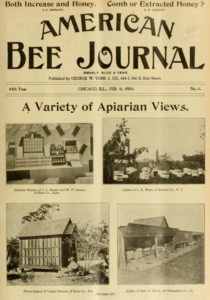 This revealed that The American Bee Journal had featured Mr. Honess for his uniquely-built beehive, or bee apiary. There he was, on the front cover of The American Bee Journal, February, 11, 1904. He is pictured by the stately structure, sitting proudly with his long German pipe. 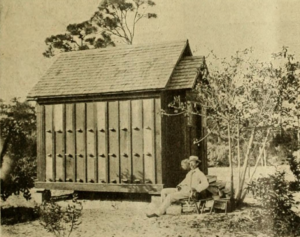 He had two such structures three miles apart, each holding 75 bee colonies. “Bee-keeping is not the only work I have to do. I am a truck-farmer, shipping pineapples and tomatoes, and have to cook for myself besides. That is what makes me think so often about the sisters who are interested in bee-keeping, and who make the future still sweeter.” This would indicate that Anna Price had already left George by this time. 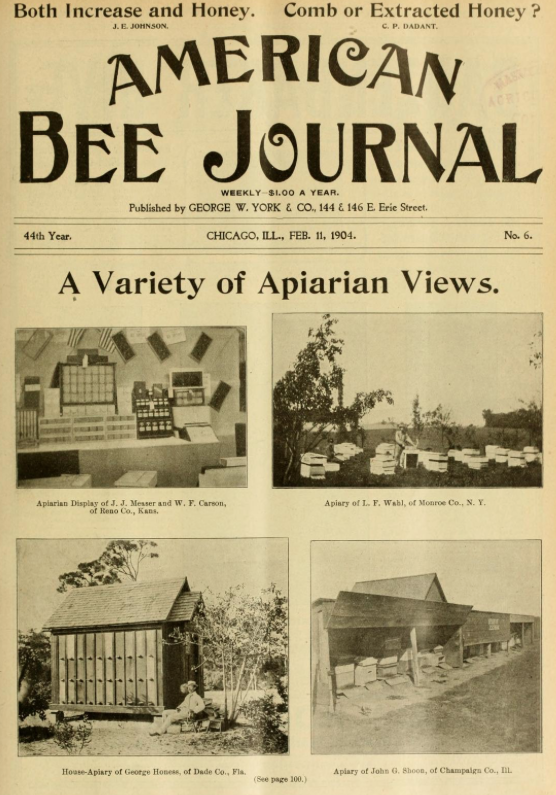 The unique bee apiary was also featured in a 1915 bee-keeping journal. 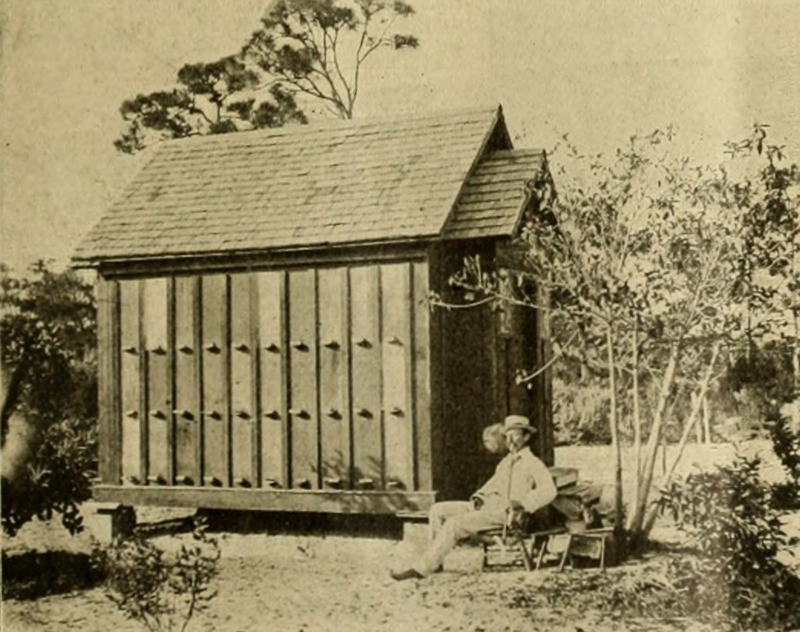 The author had heard of Mr. Honess, and found the bee apiary in Delray, but Mr. Honess had been gone a few years: “No one seemed to know very much about the owner, except that his name was George Hoeness [Honess]. He owned a couple of town lots, and the bees there, and had been gone for two years.” The author, E.R. Root, was very interested on how he kept out ants by having each corner supported by a concrete piling with a tiny “moat.” (Gleanings in Bee Culture, Volume 43, page 286, April 1, 1915). 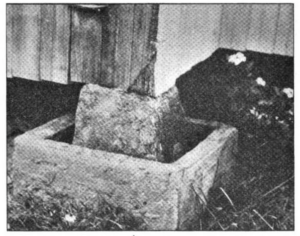 The unique design for keeping ants from the beehive. Now that I had Honess’ first name, I started searching at Ancestry.com. I found his 1910 census entry, stating that he was living and working at the Boynton Hotel, Major Nathan S. Boynton’s beachfront estate. He listed his marital status as “widowed,” which was not accurate, and listed his Florida arrival date as 1896. There were several Delray city directory entries for George, from 1916 through 1924. House designed and built by George Honess. Courtesy of Charles Hofman. was near where my grandmother lived in Germany. Adolf Hofman, who was one of the pioneer Germans of Linton/Delray, had arrived in 1895 and sent for his wife Anna Dreher, who was also from Erpfingen; she arrived in 1896. In the book “Letters from Linton” by Charles Hofman, Anna’s diary stated that a “Mr. Hoenes” built the Hofman house in 1896. That would agree with him listing 1896 as his arrival date in Florida. The beautiful, stately two-story home that George built stood until 1965, when it was consumed by fire. Another Erpfingen, Germany immigrant, Paul Dreher (Anna’s nephew) came in 1924 and became the City of West Palm Beach Parks Director, starting the Dreher Park Zoo. George’s passport application said he sailed for America December 15, 1893 from Le Havre, France. He had resided in Tennessee, Nebraska, South Dakota, and Florida. He became a naturalized citizen July 12, 1900 in Memphis, Tennessee. I then searched his name using the German version, Johan Georg Höneß, and found his birth and baptism records on Ancestry.com– born on October 30, baptized on All Saints Day, 1868, son of Michael Höneß and Regine Enzle. The name Höneß seems to be almost unique to the village of Erpfingen, according to present-day telephone directories. After 1924, George does not appear in city directories or census entries on Ancestry.com. I suspected he had returned to Germany with his newly received passport, and decided to stay. I started trying different spellings of George’s last name, and combinations of searching using John George Honess and John George Hoeness, and finally, found the document that revealed George’s true story. The Reports of Deaths of American Citizens Abroad, 1835-1974, are a series of declassified documents from the US State Department. On May 17, 1942, George had passed away in Gammertingen, Germany, while living with his brother, probably of cancer, according to the death certificate. On the report, they listed a startling new detail – George had a daughter, and had been married before he emigrated to America. The extensive sets of files, numbering over 30 documents, were from 1942 and 1948.
anything. He once told me he would, then he told me he wouldn’t. He got mad at me at that time. I’m 50 years old, live with my mother she is 76 my father now 74 I believe. I have not seen him since I was 9 as he divorced my mother in Memphis, Tennessee. I’m the only child.” Elise was living in Houston, Texas, working as a waitress. She married Henry Dry in 1927, but the 1935 Houston city directory listed her with maiden name. The State Department had to ask special permission from the Office of Censorship if they were permitted to give Elise details about her father’s estate. The permission was granted. 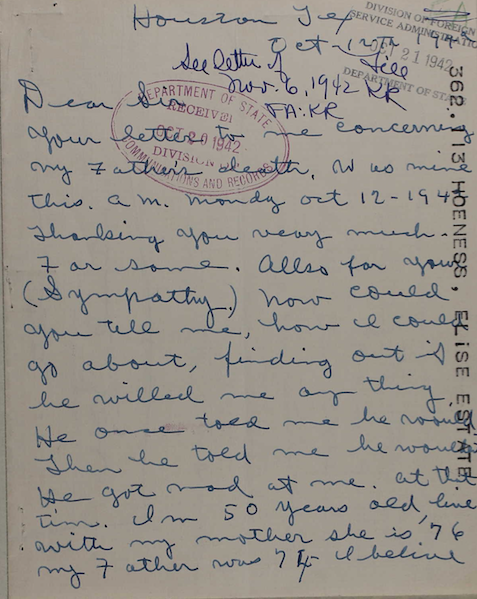 They notified her on November 6, 1942 of the following: “This dispatch stated, in pertinent part, that your father died leaving you a considerable fortune; also, no will has been found. Under German law, you appear to be his sole heir.” They cautioned her, however, that she could not pursue the estate during wartime: “…nothing can be done at the present to obtain the estate or to communicate with Germany concerning it. 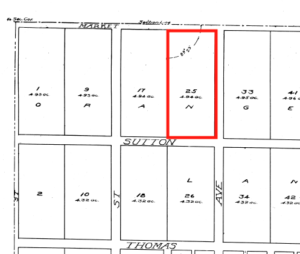 This is in conformity with the Government’s policy in enforcing the Trading with the Enemy Act.” Did George sell his Delray lands at a huge profit in the Florida Boom? A Palm Beach County courthouse trip will answer that question. Using various other spellings, I found George and his family on the 1900 census living in Tennessee, with the mother listed as “Katie” and Elise listed as “Lizzie” – does this indicate her name might be Elisabeth? George and his family were living on the estate of druggist Peter P. Van Vleet, where George worked as a coachman, and Katie as a servant. This is the only reference to George’s first wife – perhaps she was named Katherine. Other Internet searches didn’t provide any clues on her identity. The family emigrated from Germany in 1893, so Elise was a baby when they arrived in America. The census listed the couple as being married 10 years. So what was the fortune that Elise inherited? To investigate this further, the probate courts in Houston and Germany will have to be consulted – online records can’t answer this question. Elise Hoeness falls from the Ancestry.com and Newspapers.com records after 1948. She just isn’t there. How much she actually inherited probably depends on what her father had – cash, or tangible properties, such as land or a house. If he held cash, in the old Reichsmarks, she probably didn’t inherit much. In 1948, Germany issued new money (Deutschmark) and the old Reichsmark could be exchanged for the new money, but at a fraction rate – 65 pfennig (pennies) for every 10 Reichsmark. 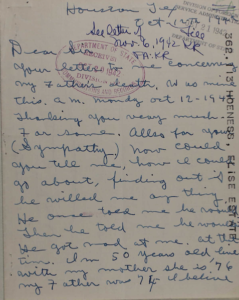 UPDATE # 1 – Charles Hofman sent me the manifest from the S.S. LaBourgogne, the ship Anna Dreher and her daughter had sailed on to New York from Le Havre, France. And right above Anna was George Honess, wife Katherine, and daughter Elsie (Elise). Charles also told me that Anna Dreher’s cousin had sailed too – Phillip Bez and his wife Ursula, along with their two children. So this adventurous party of nine immigrants from tiny Erpfingen, Germany listed their destination as Linton, Florida (what would become Delray). The Bez family became the Betz family. 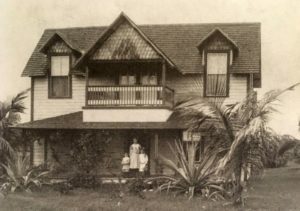 They bought land on the “muck lots” in Boynton, the fertile land along the Intracoastal Waterway, where son Frederick was born July 31, 1896. That makes Fred Betz the first child born in the village of Boynton! Previously it had been thought that Charles Pierce Jr. was the first Boynton child, but he was not born until October, 1896. With the help of Janet Devries Naughton, we also found out more about George’s first wife. We learned her name from the ship’s manifest, Katherine. Janet found a marriage record for Katherine. After the divorce from George in 1900, Katherine married Louis Buchner, also from Germany. Somehow, that name sounded familiar to me. I looked again at the 1900 census – and Louis Buchner worked as a gardener at the same Van Vleet estate as George and Katherine! So did Katherine and Louis start an affair, and did she leave George – or was she in an unhappy marriage? That question we cannot answer. Katherine’s maiden name was listed as “Sellers,” but I suspect it was Zellers, which would be a more common German name. Louis and Katherine had two sons, Louis Jr. and Otto. They eventually moved to Houston, where Katherine passed away at the age of 80 in 1946. Looking at obituaries, I have found the Buchner descendants, so I will be contacting them to find out what happened to Elise and the fortune. palm-reader and psychic. The relative did not know the extent of her holdings when she passed away, but that information should be in the Houston court records. We also looked up land records from Delray. 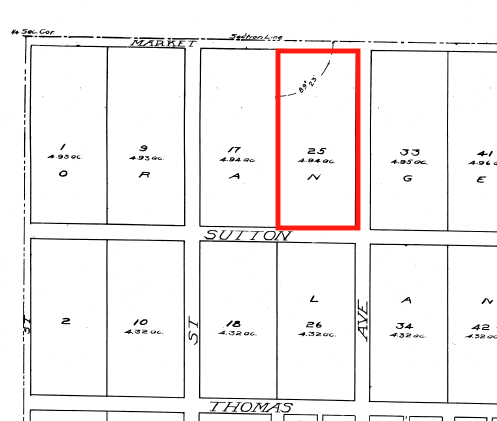 George Honess bought block 25 (5 acres)in the original Town of Linton plat on June 16, 1900. This block was in the “Orange and Lemon” section of the town plat. Today the block has houses and borders Lake Ida Road. He bought it for $100.00, sold it to Adolf Hofman, then bought back a few lots in the same block. This agrees with what the man in the beekeeping magazine had heard about George. So the money or holdings that George had in Germany when he died did not come from land sales in Delray – perhaps he himself had inherited money or property. This wild, twisted tale all emerged from a simple personal ad in a 1902 newspaper. Stories can and do emerge from the smallest events, as if those from the past are reaching out not to be forgotten.